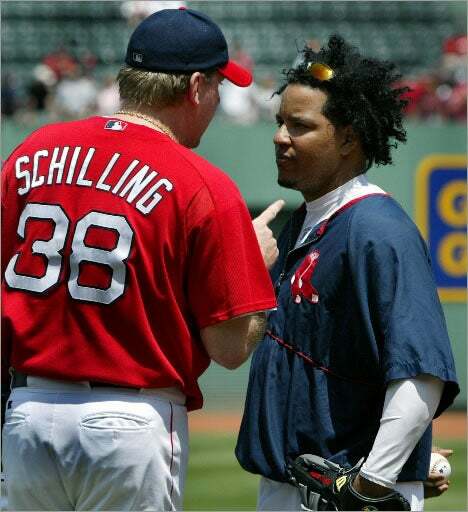 Rehabbing Red Sox righthander Curt Schilling this morning said he thought the Manny Ramirez situation has affected the team and keeping him in Boston for the stretch run could present a problem. “At the end of the day you’re taking the field with a guy who doesn’t want to play with you, doesn’t want to be there, doesn’t want to … obviously effort-wise is just not there and that’s disheartening and disappointing,” Schilling said during his weekly appearance on Boston sports radio WEEI’s Dennis and Callahan program. Does he think it’s time for Manny to go? Schilling was asked if he was insulted by Manny’s “the Red Sox don’t deserve a player like me” comment. “I was here for the end of both Pedro [Martinez] and Nomar’s [Garciaparra] situation and I’m not sure how there’s any parallels there,” Schilling said. “… I’ve always felt the organization extended a lot of courtesy Manny’s way and I know Terry [Francona] as a manager, like with everybody else he went that extra mile for Manny. It’s disappointing to see that not get recognized, but that happens. Could this situation have caused the Red Sox, losers of 4 of their last 5 on this homestand, to lose its focus? “Absolutely, absolutely,” Schilling said. “This is one of those things … the trading deadline is always a weird time for everybody, no matter what team you play for but this … when things are going on with Manny, the fact that Manny’s locker was in the back, and not with the rest of the guys, ended up being a thing that worked because media wasn’t hovering, there wasn’t stuff going on, but it appears to me that he’s moved out into the clubhouse now to try and make sure he gets his message broadcast and that’s … it’s not fun. Schilling also said would give Jason Bay his No. 38 (and Bay’s number with the Pirates) if Bay ends up joining the Red Sox in exchange for someone to give a five-figure donation to his charity, Curt’s Pitch. “It pretty much can be had right now… yeah …we’ll work something out,” Schilling said. Will Manny be traded by 4 p.m. today? Did Manny lose support of teammates after Jack McCormick incident? Have any teammates told Manny to knock it off? Does he wish that Terry Francona would do what Jimi Williams did to Pedro Martinez when the former Sox manager told Martinez he wouldn’t be starting when Pedro showed up late to the ballpark? On Manny’s effort running up the first-base line on a ground ball behind third base during John Lackey’s no-hit bid on Tuesday night. Is Manny quirky or a distraction? Is there a better place for Manny to play than Boston?